Quick Review of "Fundamentals of Object-Oriented Design in UML"
Before Christmas, I was looking around for some reading material to accompany me on my walk down the yellow brick road to "O-Oz" (yes, I am the one looking for a brain). It just so happened that Hal Helms had his web site redesigned right around the same time and I stumbled across his "Recommended Reading" page. 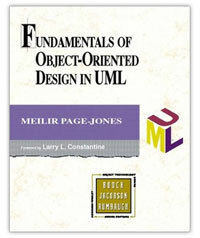 One of the books on his list is "Fundamentals of Object-Oriented Design" by Meilir Page-Jones. Hal rated the "content" 5 out of 5 (best) and the "readability" 5 out of 5 as well. In addition, Hal's recommended audience is "Any developer who's working in Object Orientation." So, I figured, "How could I go wrong?" After finishing the first 50 pages, only one word comes to mind ... Wow! Seriously. No, seriously. I've learned more about Object-Orientation (OO) in the first chapter of this book than all of the blog posts, columns and articles I've ever read on OO combined. The writer uses an extremely easy-to-follow and easy-to-understand approach to drive home a solid basis for understanding OO. As most programmers know, OO is often subjective or "in the eye of the designer" so-to-speak. Yet, Meilir Page-Jones cuts right through that with examples that make those found in many other text books (think Java, ActionScript and many others) which attempt to cover OO, but fall significantly short when compared to this book. The examples used by the author are written in a "non-specific-language" devised by the author himself. If you're wondering, it's actually a blend of four programming languages: C ++, Eiffel, Java and Smalltalk. Ultimately, I find this book and the code itself to be accessible to any programmer from any programming language. This book is hard to put down and I look forward to the moments when I get to continue my journey through "O-Oz." This book probably won't end up on my bookshelf though … I've found a place on my desk so I can keep it closer to me.